This new M600 will have a turquoise striped barrel made of cellulose acetate. While it is not entirely clear at present, if it follows the styling of the M600 Pink, the barrel will be opaque and devoid of an ink view window. The section, cap, and piston knob are made from a high quality resin that Pelikan bills as “Magnolia White.” The furniture will be 24 carat gold-plated and includes two cap bands, two trim rings at the piston knob, and a single trim ring on the section. The clip is done in the typical pelican’s beak style and the nib will be two-toned 14C-585 gold available in the standard sizes of EF, F, M, and B. In addition to the fountain pen, a matching ballpoint will also be available. Like the M6xx models that preceded it, this M600 will come packaged in a specially designed gift box with laces along the front done in turquoise. The most important aspect of this release, to me, is the suggested retail pricing. Pelikan released the M605 White-Transparent at a very competitive price in the USA and it has been unclear whether such favorable pricing would be continued, particularly in light of the recent increases handed down in Europe. In the USA, the M600 Turquoise-White will have an MSRP of $500 giving it a retail price of approximately $400 (the standard 20% off MSRP). That is very competitive with regards to what you’ll find offered by overseas vendors. If you’ll recall, the White-Transparent had an MSRP of $475 and retailed for $380 making this an increase of only about 5.25% which seems reasonable and still well below what the M600 Pink sold for. Just like with the prior models adorned in white, concerns about staining will persist and be well founded. I have found the white resin fairly resistant to staining with regular maintenance and proper, conscientious ink selection. The Pink and White-Transparent proved very popular and quickly sold out of many retail channels. The Turquoise-White is expected to be no exception therefore if you want to pick one of these up, your best bet may be to do so early in order to secure your chance at owning one. Well that’s certainly a beauty. I wish my wife wanted it so I could buy it for her. Pretty impresive Josh…. as always nice job. I agree that the prices bouncing all over could create problems tho. Pelikan needs to get a handle o pricing consistency. Thanks! Some consistency would be very welcome. This one is a beauty. My wife already decided she wants one (like there was any doubt 🙂 ) – I may need to borrow it from time to time. I must say I was a bit surprised though, because I thought this one would be a M605… But seeing it, I have to say that the gold finish is a perfect match. It is a very good start, now they need to release a big one 🙂 . I do think that the gold compliments the colors nicely but I think the Turquoise could have pulled off either finish. Wow. This will be my first white pen! You mentioned ink selection and maintenance– any specific suggestions? Can you use dish detergent on the pen body? (I will get one anyway but I’m sure the staining will drive me crazy. ) Thx! I’m no ink expert but rules of thumb include caution with super saturated inks. Reds and purples tend to leave stains. Certain inks that claim permanence can be problematic. Even some of the risky colors can be OK if you don’t leave them sit in the pen for too long and practice good pen maintenance. There are no absolutes here. I tend to use known safe, water soluble inks in my white pens and I haven’t had any issues. Perhaps I play it safer than necessary but, like you, staining would drive me crazy. 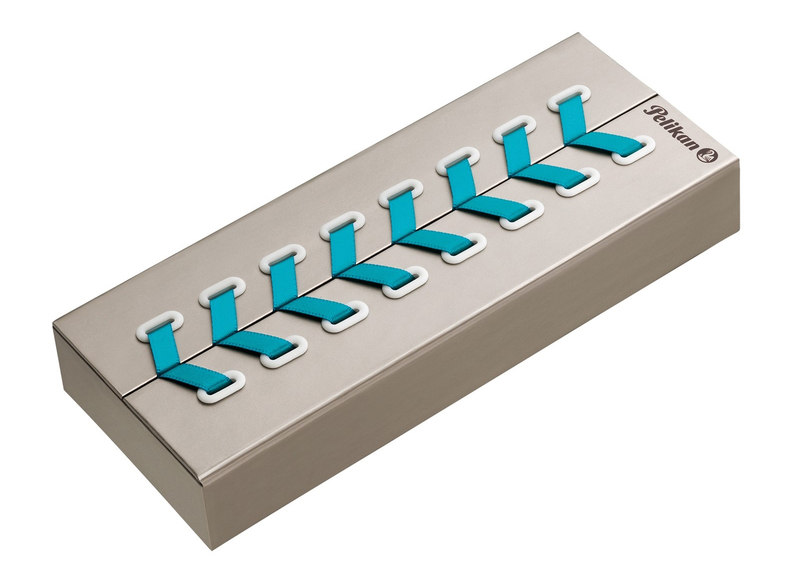 I’m not fond of the turquoise and white combination (which would look better with silver-colored trim), so I think I’ve dodged a bullet here. I did buy an M400 Tortoiseshell Brown recently, so I have no budget for another pen, anyways. I’m still hoping that Pelikan will release an M600 Tortoiseshell Brown–when my bank balance is in better health. I do have two white Pelikans, the M600 White Tortoise and the M605 White Transparent (I call it the “Ghost”), and neither has stained. I don’t put reds or purples or in them. So far, so good. A little drop of Dawn dish detergent in cool water is good for pen cleanup, as is flushing with a mixture of 1 part ammonia to 9 parts water, rinsing thoroughly afterwards (*never* use hot or warm water on your pens!). I use a damp Q-tip to get the threads clean, if necessary. Fair enough. I wouldn’t hold your breath for an M600 Tortoiseshell Brown this year but anything can still happen. I don’t know what to say. As the inveterate retro grouch I am forced to admit that Hanover has tossed the dart and technically hit many of my buttons: It is an M600, my preferred form, it’s at least slightly outside of the standard offerings, however, this white and stripe combo is becoming something of a standard in itself. It is even a pretty good looking pen by my measure. But, … it’s just not the thing that will get me to click the ‘buy’ button. And here is the deep Irony; Every time they come out with a new M600 offering, I know that the reveal of the one I am waiting for is just another year (or more) down the road. I fear there won’t be an M600 Tortoise offered before I am ashes and dust. It looks pretty good with the gold furniture but I think I agree with the 605 crowd. I think a lot of people would be excited to see a tortoise in the M6xx line-up. No word on one though. Hopefully it will be a long time before your ashes and dust and you’ll get to finally see this dream come true. OMG! Josh, you hinted at this one recently, and now here it is! I have the Pink M600 and the White M605, and this Turquoise M600 will fit in very nicely. Pelikan sure knows how to push my buttons! I really do like the gold-plated trim; they could have gone either way with this color, but I think the gold adds a very luxurious touch. I’ve been looking at the Ocean Swirl lately because of the color, but so far I’ve shied away from M800s because of their larger size and my small hands. M600 is about the largest I want to go, so I’m very happy they chose to put my favorite color in this model. When I was trying to picture a turquoise pen, I was envisioning it with black, but the white gives it a very fresh appearance. I’ll definitely be pre-ordering one of these. Now, the only remaining question: to just have the nib tuned, or reground into a stub? What a wonderful quandary to be in! I hope that I didn’t oversell it for you. Thought it would be one that caught your eye. I’m getting mine ground to an architect nib. No, you didn’t oversell it. There’s no way I could resist a Pelikan M600 of this color, especially since I have her sisters, Pink & White. lol I’ve already pre-ordered and having it ground to a stub. Now, there’s just the waiting…. Now what do you think of the M120 Iconic Blue? Pelikan isn’t making it easy this year. I like the Iconic Blue, however…I’ve left a comment under that pen’s review. Pelikan certainly isn’t making it easy on us! Well, I’ve been waiting about two months, but yesterday I finally got my Turquoise-White M600. I got a Broad and had it stubbed at CFP (nibs.com). Gena was the one who worked on it, and I am very pleased with the way it writes. Along with the Pink M600 and White M605, it makes a very nice trio. And of course, it’s even prettier in person. The blue stripes have a beautiful translucence that gives it a shimmer when I hold it up in a strong light. I am slightly biased, because this is my favorite color. However, even if I am trying to be objective, I think Pelikan scored a hit on this one. I’d love to see them continue thinking a little out of the box on future models. It’s refreshing. Next, I’d like to see an Olivine M200. That’s quite the wait but definitely worth it. This one does look much better in person. Enjoy the trio! Ooh…this is the first time I’ve had a really negative reaction to a new release from Pelikan in some time (or ever). That is one gaudy looking pen. I suspect it might look a little more tolerable in person. Still, kudos to Pelikan for offering something a little different. OT: Joshua, have you heard any rumors about another M101N release for this year (if you can say)? I had the same reaction to the M205 Taupe and the M600 Pink but both have grown on me and they certainly looks better in real life than the product shots. I’ve learned to never completely close the door on any bird (much to my wallet’s dismay). I have heard rumors of many releases for this year but an M101N is not amongst them. Doesn’t mean it couldn’t happen though. Obviously I will post as soon as I hear. Yeah, you never know. I’ve had pens I didn’t like at first that I eventually liked a great deal. 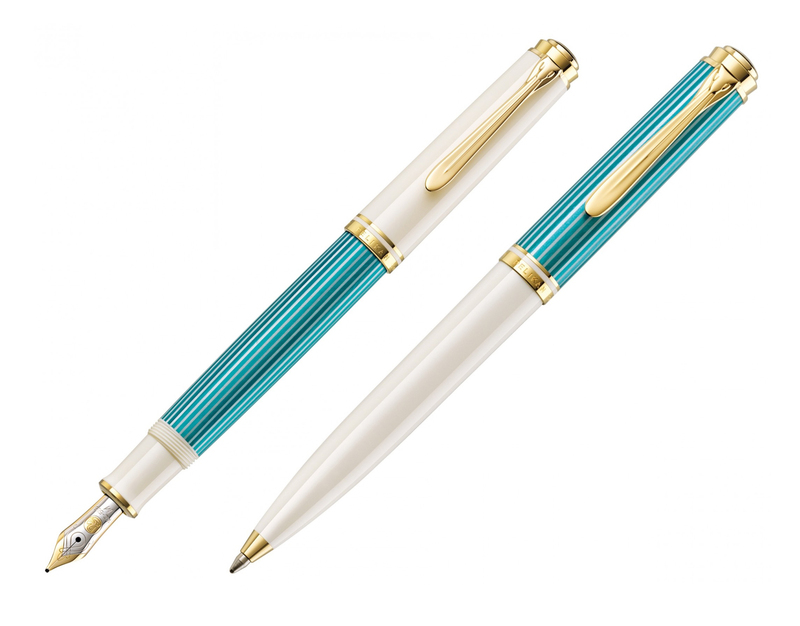 However, turquoise might be one of the few colors that just don’t work for me in a classic Pelikan striped binde. Thank you all for the white pen reassurance, very helpful. To me this pen looks like a fresh spring garden! And after the freezing cold, grey & slushy winter we’ve had, I cannot wait to see it land on my doorstep! Cheers! I hope that the wait isn’t long for you then. I was shown a photo of this by an Italian shopowner last summer and was wondering how long it would take for Pelikan to bring it out. It is a stunner and even nicer than I remembered it from the photo I saw last year. I have the Pink 600 and the White Tortoise 600, this series being one of my favourite sizes. I won’t really be able to resist buying this one. My assistant in the office calls my White Tortoise a “summer pen”, but this one is definitely a “spring pen”. Having bought the Ocean Swirl last year, this is not good news for the bank balance… but then…. So you were able to resists the M605 Transparent-White then? 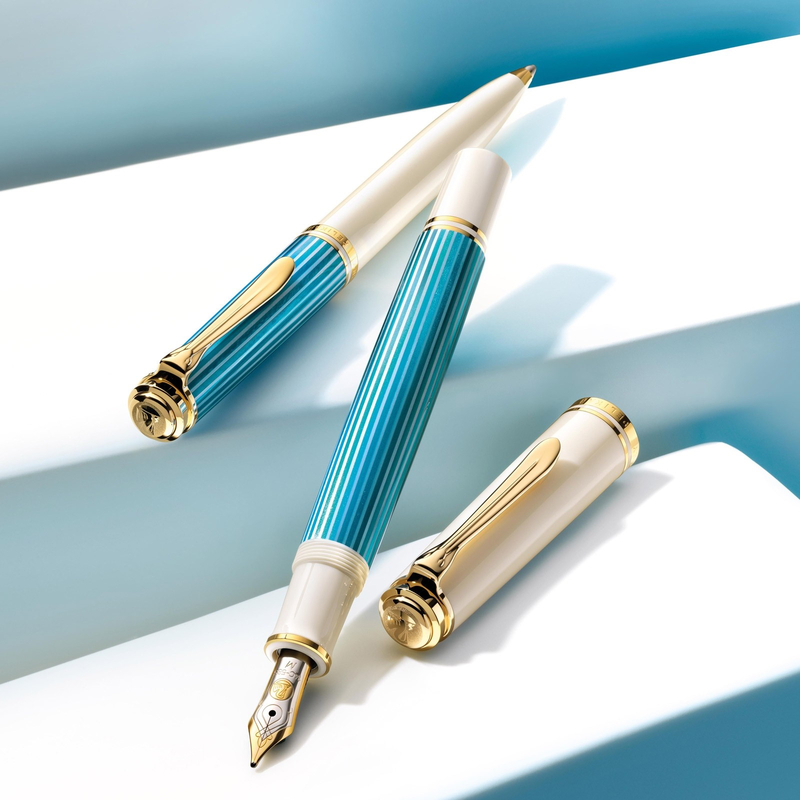 Yes, but not the Ocean Swirl- one of the truly great creations of Pelikan in recent years! If we go by recent promotional pictures, the ivory-white shown here is probably just the same stark white seen on the transparent-white model this past year. Pelikan’s marketing doesn’t have to change this approach of “representing” their pens as long as the sales hold up, complaints notwithstanding. IMHO, properly depicting the products in promotional shots is likely to help brands in the long run. I agree with your observation and anticipate the two white pens to be done in the same shade. I think a proper depiction should be an easier bar to obtain. how did i miss the birth of this pen? wow.. it is gorgeous.. last time I got the pink i ended up paying $500 but this will become a hard to find pen/collector’s item in a year. People would kill to get the Pink for $500 these days. I recently saw one sell on eBay for over $1000. I think the Turquoise-White will be much of the same and I think many who bought the Pink will be in line for this one.